Whenever I tell someone that I have multiple credit cards, they for some reason like to assume that I cannot pay my bills and this is why I have them. A lot of my friends don’t have a single credit card, so I can understand why they are afraid of them. We pay nearly every one of our bills with our credit cards. The only one that I believe that we do not put on our credit cards is one utility bill and that is because they only take cash, check or a wire transfer. I recently just received $75 in gift cards, which I will be using for Christmas. I still have around another $200 in points, which I plan on putting towards a vacation next year. I also have earned a couple hundred dollars that I redeemed directly as cash and some clothing gift cards. This is all from the PAST YEAR. I just starting using a rewards credit card a year ago, so it really is that easy. I used to always use credit cards to pay my bills just to get the extra cash flow (which will be discussed in the next point), but now I mainly only do so because of how easy it is to rack up points. Why turn down free money? Earning rewards points is easy. I just have all bills set up to take my expense money from my credit cards. I apply bills, work expenses, food, shopping, and pretty much everything onto my credit card. These are just my normal everyday expenses. I wish I could put my mortgage on it! I have heard of some people being able to do this though, but my bank does not allow it (which makes sense to me). Having more cash flow is not a HUGE positive of putting all of our bills on credit cards, but it is nice to be able to have our money for around a month longer than usual. This month may earn minimal amounts in interest for us, but it is better than nothing. It is not like we are paying anything to have our credit cards, so why not? Do you tend to forget to pay your credit card bill when it comes up? Well now if you forget to pay, you will most likely owe a lot more in interest because you will be applying so much to your cards. It also might be hard to keep up with what your spending limits are. You never want to go over 30% of your utilization rate because then it will affect your credit negatively. 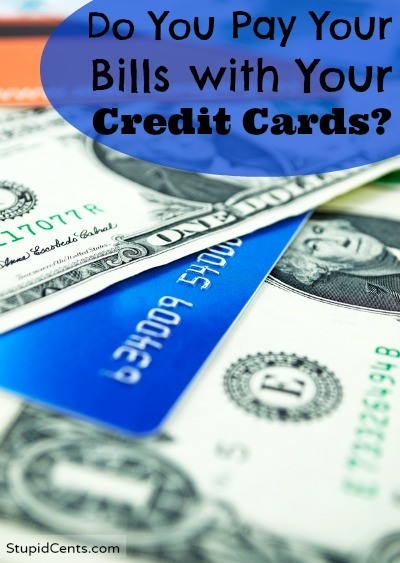 If you can’t pay for all of the bills and expenses that you are putting on your credit cards, then having multiple credit cards is most likely not a good idea for you. The negatives of hurting your credit score, owing money due to interest and being unable to control your spending because you are putting it all on your credit cards definitely trumps any rewards points that you may be earning. So let me know, do you pay your bills with credit cards? Or do you mainly use cash? I do the same thing as you in regard to paying some bills like my gym membership with a credit card just for the cash back. Its like a 2% discount on purchases. I pay off the balance each month and still am under 30% utilization on the card’s limit so I figure it works out in my favor. I totally agree. I love my cash back rewards card! I use it for every single purchase I make, pay it off promptly, and in return, my Christmas shopping is 100% covered every year and it costs me $0 in interest.